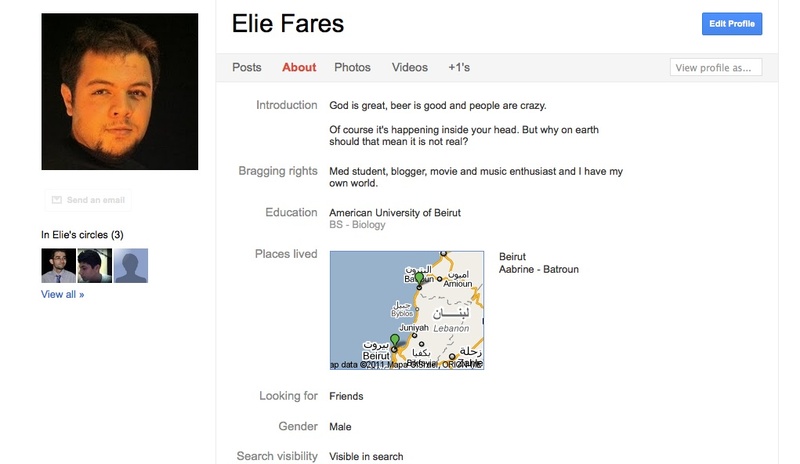 Posted on November 13, 2013 by eliefares Tagged birthdayfamilyfriendslifepersonal	Comments19 Comments on 23. I turned 24 today. And it was a horrible day. I woke up feeling I couldn’t breathe, feeling like it was just another day to get through the motions. I went to the hospital. I took care of my patients. I did what I had to do but not more like I usually do. I smiled as people wished me happy birthday. I had yet to see the happy in the sentence. I didn’t know what else I could do. Perhaps there was nothing really wrong about today. But I didn’t see it that way all day. Call it overt-anxiety. Call it over-scripting of things and dramatization. But that’s how it was. My head told me today was a bad day and I didn’t try to tell my head it was wrong. And then when I got home this evening, exhausted and feeling mentally drained, my little brother surprised me with a piece of cake on which he had lit a candle. And I hugged him as he sang me happy birthday. There was nothing else I could do. I thought that would be it until my parents called and my mom sang me happy birthday over speaker phone. And my grandparents called to wish me long life and the only thing I could do is wish them health. Their calls filled me with so much joy that the only thing I wanted to do was go spend my day with the people who made it as such. Then, as I headed to the dinner my friends begrudgingly dragged me to, I realized that many of the people that made 23 the year that it was were around that restaurant table, had called or texted me earlier that day. Those people had changed their pictures into a collage of their memories with yours truly. They were really, positively happy that this was my day and they wanted it to truly be a happy birthday. This post may not mean much to most of you. But, as I turn a new page, my thoughts turn to family and friends – cliche as it may be – in order to tell them thank you for being there and I hope they’ll keep on being there. Here’s to all the people that made me. Here’s to all the people that make each of my days worth living. I turned 24 today. And it turned out to be a good day, indeed. Here’s to those few people that force you put your guard down to let them in. They don’t ask anything in return except some time well spent: having impromptu lunches to laugh your heart out, candid sessions over some weird combinations of tea leaves you never thought existed or in-depth discussion of politics during which you almost go at each other’s throats one second only to high-five the next. Here’s to those few people whose idea of you exists only in what they know about you, not of what people think they know or what people say or what people want others to think. Here’s to those few people with whom you are not worried about going slightly crazy sometimes. And they still want to be seen in public with you. Here’s to those few people who might be very different from you on all the things that you thought counted and still end up finding more common ground than divergence. Here’s to your harshest critics, the ones who bash your work the most when its level falls off, who let you know exactly where you slipped and how to fix it. Here’s to your best supporters, the ones who can trump your family sometimes – those people who let you know when you excel and who support you even when you don’t feel like supporting yourself. Here’s to the people with whom you can eat an entire box of sweets and absolutely not give a damn about how you look like 5 year olds who found their holy grail of chocolate. Here’s to those people you don’t see in months but still manage to pick up where you left off as if no time had passed. Here’s to those who know exactly when you’re blowing smoke and are not afraid to tell you off. Here’s to the people who help you find the silver linings of your woes whenever you feel overwhelmed. Here’s to those people who have no problem driving to your place late at night because you need someone to talk to. Even if it means trying to find a place to park in Beirut. Here’s to those people you have no problem putting your feet up on the tables of their homes. Here’s to the people who know all your inside jokes. Here’s to those who are crazy enough to fathom liking you without being on some form of antipsychotic. I wouldn’t be who I am without all the awesome friends I’ve had. This blog wouldn’t be what it is without them too. Here’s to good friends and good times and maybe some good wine or scotch too. Posted on November 12, 2012 by eliefares Tagged birthdaycancerfamilyFrancefriendslifeLilleParentsParisthoughtstrust	Comments11 Comments on 22. As my friends sat around me singing happy birthday to you on that cold Saturday night which wasn’t even technically my birthday, I felt happy. The rain glistened off the window in front of me, it was cold outside but I felt the warmth of the party that was celebrating me turning 22. I wish I knew in that moment that some of those friends were not there to stay. I wish I knew in that moment what year awaited me as I blew off those candles and people applauded. I was standing alone in a crowded room on a cold February night and I was just realizing I knew absolutely no one there even those people whom I thought I knew all too well. And they’re not speaking to me, pretending like they didn’t know me. The fake smiles, the fake truths, the fake nods, the contest of who’s acting like they could care less… I had gotten tired of them all. The amount of insecurity that people had was way too unacceptable for me to handle anymore. And as everyone smiled and hugged each other, I started wondering: what did I do wrong not to be the one being welcomed like this? It took some time for me to realize that I had done nothing wrong at all. It took some time for me to realize that keeping your guard up is a necessity. Trusting people easily should never be a possibility because the amount of assholes in this world is way too high. I realized I shouldn’t be surprised to have been let down because your expectations out of others towards you are very rarely met. So you do your best because you hope that this would somehow return good upon you. But you expect nothing. Even people whom you thought would never ever disappoint you end up doing so. And they throw around lame excuses to justify doing so but you would have reached a point where you couldn’t care less anymore. The theory is easy. The practical aspect of it is still a work in progress. The saddest part though is that for a while after that I had to fight the urge to pick up the phone and call. Your home away from home where you are foreigner and yet you fit like a glove to your hand. The lack of complexity with people. The lack of the need to be two-faced in order to get ahead. I remember the great people I met all too well. I remember the good times I shared with them. I remember the places I went through. I remember standing in front of that Royal Palace and feeling infinitely happy. I remember sitting under the Eiffel Tower on a warm Paris night. I remember walking through a cemetery where people I could only dream of approaching were laid to rest. I remember being at the place where the world’s major decisions are taken. I remember Porte des Postes. I remember Cormontaigne. I remember the grey August clouds overcast on the city as I saw it from the ICU of the hospital where I had spent most of my time being treated like a colleague. I remember those walks I took just to be alone amid the greatness of the place whose air I breathed. And I remember her with her blond hair and red lips and that rainy night in the streets of Lille. It’s easy to get lost inside your own problems which always seem so big at the time they’re happening. It’s very easy to make them seem like they are the worst thing that could ever happen to a person. It’s very easy to over dramatize them: why me? But on a Monday, in a waiting room at a hospital in France, I realized how pitiful it is of me to dwell on the friends that were no longer there, on the grades that weren’t that good, on the things that I could’ve done. I saw people trying to convince that twenty year old boy of the need to cling to life as much as possible as his body rejected the heart transplant he had spent the previous year undergoing. And I realized then, as I tried to get him to feel better, that my problems are just so small. She’s not invincible. She’s not going to be here forever. She’s weak. Her own body is killing her. As you look upon the worried face of the woman who gave birth to you, it can’t but kill you inside to see her hurting and to know her thoughts are about the potentiality of her not being there for you anymore. And you go in with her to her surgery because you know that being there for her will make all the difference. And it almost kills you to see her there, a shell of the person that she is, because of the drugs they injected into her veins. But you know it’s all for the best. And your senses perk up when the surgeon is stunned to find the procedure he had thought would be fairly straightforward was not. And your worry increases when you find out that the cancer was not as localized as they thought it was. Then when she wakes up from the anesthesia and the first faint word upon her lips when she sees your face is “habibi,” and despite the severity of it all, your worries in the world subside for just one minute. Even thought she might lose her hair. And even though she might lose her weight. You’d still do anything for her to be there for you. And it may be selfish but it’s really not because you know that there’s nothing more she’d want as well. Despite your guard being up, some people roll Into your life who end up surprising you. And you feel happy about them being there. things end up getting better for you and you remember the good times you spent and you realize that you regret nothing at all. You find the family which you had taken for granted will always be there for you. You meet new family members who were taken away from you by life and and time space and you find more in common with them than you’ve thought possible. You grow, you become more critical, you stand up for what you believe in. You take things in and hope that your life isn’t going to waste. At least now you know where the 13 in State of Mind comes from. And right now, I’m felling 22 one last time, one last day. And thank God for that. Hello November 13th. Hello year 23. 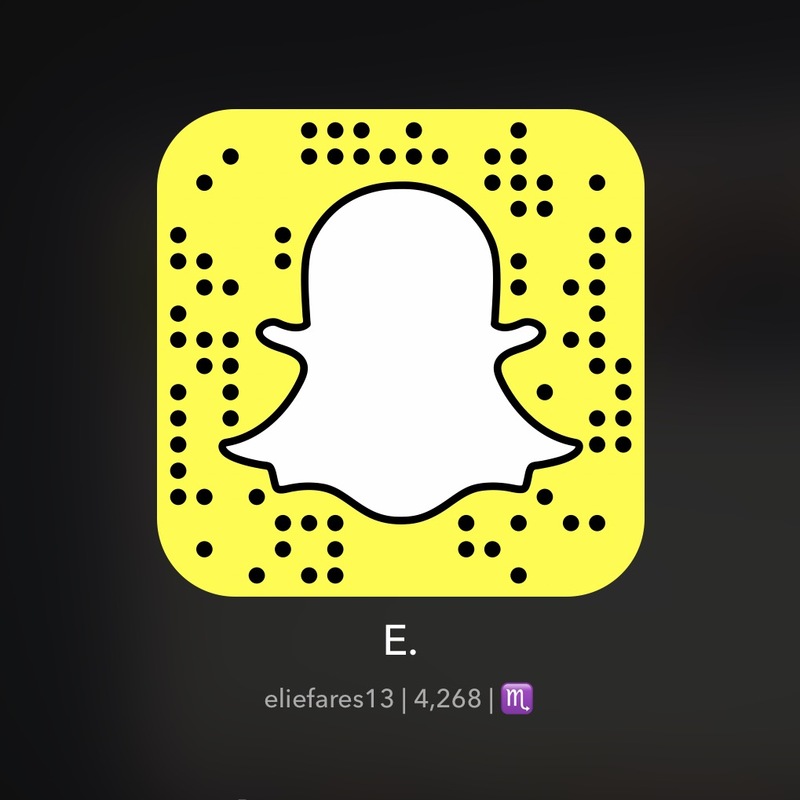 Posted on June 30, 2011 by eliefares Tagged +1FacebookfriendsGoogleHangoutLikeMobile AppPicturesProfileSparksTwitterVideos	Comments97 Comments on Want A Google+ Invite? I just got invited to use Google+ and I have to say, there is so much promise there. 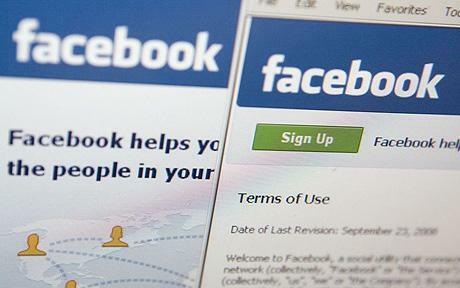 It’s a great and smooth interface that combines elements from most known social networking platforms. Your home screen is a feed of everything that the people in your circles share. You can comment and interact with them on the home feed. You can also share things you like, specifying which circles you want what you share to appear to. In addition to that, you can categorize which stream you want to see by simply clicking on the circle you wish to check. Moreover, there is a cool option called: Sparks. It basically allows you to pin interests on your profile so you can stay updated on everything that’s current in that field. 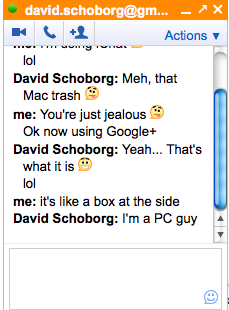 Also, another cool feature is hangout. It allows you to have a video chat session with a selected friend or circle, sort of like hanging out in cyberspace. Google+ also has a mobile app, although it’s not available for all platforms at this point so I can’t test it out on my iPhone. You also get to mute posts you don’t want to see by clicking on the arrow next to the post. You can update your profile with a tagline that summarizes who you are. There’s a “Bragging Rights” section where you post things you’re proud of. Places You’ve Lived and Education are also included on your profile. You get to post pictures and videos. 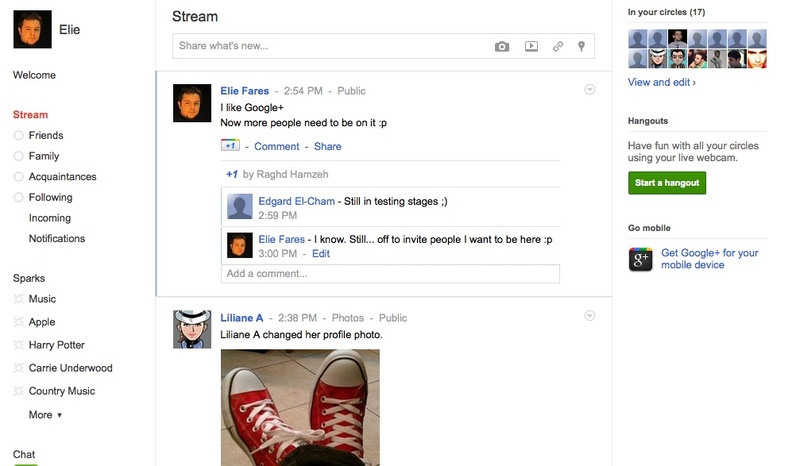 Gtalk is integrated with Google+ as well, even for your contacts that don’t have Google+ yet. And instead of the “legendary” Facebook like button, Google is introducing its +1 version, which is widely used on the social networking website twitter. You can check all the things to which you have clicked +1 directly from your profile. 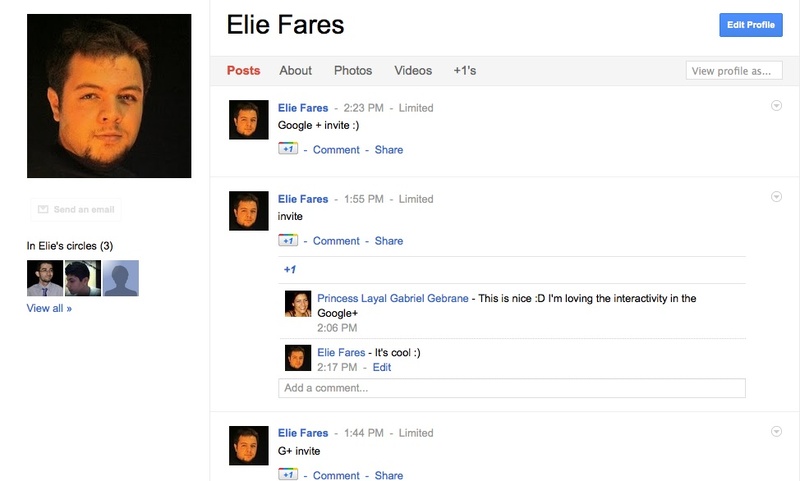 That’s pretty much what I’ve used out of Google+ so far. I’ll make sure to edit this post with any additional information. Now, if you want an invite, let me know your gmail email in a comment on this post. PS: If the invite doesn’t work right away, try again at some other time. If you receive an email from me, then you are invited! My little brother has had both his email and Facebook account hacked twice over the past two days. The person who hacked them hasn’t actually done anything with both accounts (except a small comment) while he still had access to them but I began to wonder: why do people do that in the first place? What’s the point? Are they not content with their own online “lives” that they have to go and snoop around those of others? After all, the point of Facebook and social networks is not to show who has the most friends, who has the most wall posts or picture comments, it’s to connect with people and make use of the connections you already have. What is the joy of hacking another person’s Facebook account or email and use them to send out weird status updates or weird comments? Do they think this person’s friends won’t know something is messed up with this account? Or that this person won’t find a way to get his or her account back? I guess the downside of being active on a social network means that, like in real life where those who are wealthy are sometimes the envy of those who are less fortunate, those who are actually active and have connections with whom they frequently interact are the envy of those who are friendless and have no one to talk to. The only thing these ten minutes of unauthorized access to the hacked account bring is stress to the person whose account was jeopardized. Everyone knows you get your account back but people fear that the person who hacked their account would post stuff that would be a serious breach of their personal space and privacy. I think the most basic way for someone to prevent getting their account hacked is to disable his/her “friends” from viewing the email he/she are using to access their account and to enforce the strictest security and privacy measures possible. The less you share, the less you get in trouble. That is my motto, at least when it comes to Facebook.